Born: 1802 at Mill Creek in Barren Co., KY. When John Mulkey, minister of the Mill Creek Baptist Church in Kentucky, took his stand for being a "Christian only," his son Philip was only seven years old. But he could not have escaped the force of his father's decision. It sealed the direction of young Philip's life. The story of John Mulkey is on this link. The Mulkeys were friends with the Thomas Crawford McBrides and they had a son that year, James. The lives of Philip and James would one day be intertwined in the far west of America, in a land that would some day be named Oregon. The story of Thomas C. McBride is on this link. The story of James McBride is on this link. Philip had three younger brothers: Isaac, John Newton and James Harlan Mulkey. They also followed in the footsteps of their father and preached in the New Testament churches. They were the fourth generation of preachers in their family. Their grandfather Jonathan and great grandfather Philip were preachers among the Separatists Baptists in South Carolina. Their uncles Isaac and Philip were also gospel preachers, following the lead of their brother John in preaching simply the Scriptures. Philip married Martha Martin when he was 18 and she was 16. That age of marriage for women was not unusual. Some married earlier than 16, especially among unbelievers. For the first 15 or 16 years of their marriage, they are thought to have lived in the vicinity of Tomkinsville, Kentucky. Most of their children were born there. Philip and Martha moved, first to Illinois and then to Missouri. Philip was preaching by this time. They left for Oregon April 1st, 1853. Three girls and two boys were still at home and traveled overland with the family. Their dad was wagon master of the large train. This is a strenuous undertaking for a man 50 years old. Some of the married Mulkey children may have been in the train as well. Their wagon train crossed the plains is less time than many. The passage required four months and eight days, enabling them to arrive early in August. By Fall, they had settled on a Donation Land Claim west of Eugene. Sons John Thomas Mulkey and Welcome Hays Mulkey settled near by, as did William B. Barger and his wife Elizabeth Mulkey Barger. She was a daughter of Philip and Martha. John's primary work in Oregon was a circuit-riding ministry. He was involved with the Pleasant Hill Church of Christ, southeast of Eugene, as well as the Grand Prairie Church and the Oak Hill Church on the west side. His riding circuit included some spot in Benton County and we speculate that he was the preacher at Philomath, a few miles west of Corvallis. The church was a gathering place for several families of Mulkeys -- all distant cousins. The reader may wish to see the story of the Pleasant Hill congregation is on this link. The story of the congregations west of Eugene is on this link. The story of the Philomath congregation in Benton County is on this link. Philip is known to have performed more than 100 weddings in Lane County. Two of those were the wedding of nephew John F. Mulkey to Sarah Sirus and Lucetta Callison to William Howard Baughman of Pleasant Hill. The amiable Martha died in 1862 and Philip married a distant cousin, Mrs. Phoebe McPherson Brashear. He had performed the wedding when she was married to her first husband. We have edited the spelling and length of his letter to a niece in Illinois so the reader can savor of his spirit. He was 83 at the time. I'm married again to a good woman and we are living happily together surrounded with all of the necessities of life and many of its luxuries. We generally enjoy excellent health. My children are all members of the church. I still preach some. Your cousin I. N. Mulkey is here and is a good preacher. He has a nice family and is doing well. We have a good country, fine fruit of almost all kinds. Stock does well and brings a fair price. We have fine churches and splendid schools, a pleasant climate, good health and fertile soil. We have need of nothing more in this world, but the greatest of all is to be prepared for the future. I hope to see you and all my dear loved ones that have gone before in our heavenly home where there is no parting. I went to Spencer Creek on the first Lord's day in this month, and in my feeble way presented the Gospel, exhorted sinners to bow to the authority of Jesus, and four noble souls responded. O! how it refreshed me. The first time I had tried to preach for over four months. I intend, as long as I am able, to hold up a bleeding Savior's love to a perishing world, remembering, that that turn many to the Lord will shine as the stars of the first magnitude. Among the witnesses to the signing of Philip Mulkey's will was Rufus Gilmore Callison of Pleasant Hill. The story of R. G. Callison is on this link. Philip died in 1893 at the age of 90 or 91. He had lived with his daughter Mrs. John (Hannah) Harris in Eugene since Phoebe's death three months earlier. Also buried in the family plot are several sons and daughters. 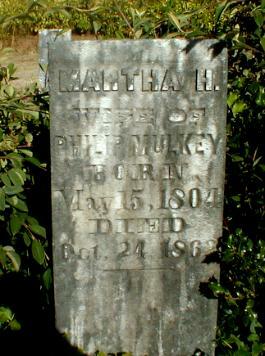 The entire Mulkey Cemetery is on line on this link. And this link. The mother of the author of this volume remembered Philip Mulkey well, as a very old man of about 90, sitting in a rocking chair on her Great-Aunt Hannah's porch, killing flies with a sort of qirt or small leather whip. Flossie would have been a child of seven at the time that Philip died. She was his great-granddaughter, and she was so impressed that she named her only son Philip Mulkey in memory of this Oregon pioneer.